Prince George’s County officials said no suspicious materials were found at a Largo, Maryland office building, where they were investigating the presence of an unknown substance Tuesday night. 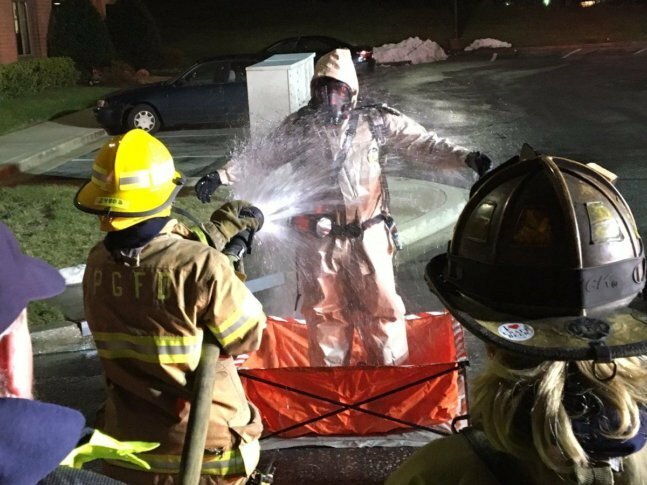 WASHINGTON — Prince George’s County officials said no suspicious materials were found at a Largo, Maryland office building, where a hazmat team was investigating the presence of an unknown substance Tuesday night. According to Prince George’s County Fire and EMS spokesman Mark Brady, three people reported feeling sick after being exposed to an unknown substance at a commercial office building on the 1400 block of Mercantile Lane around 8:30 p.m.
NBC Washington reports that the location is that of Sen. C. Anthony Muse’s campaign office. A worker at the building took a bag out of a trash bin and wafted a substance and felt “a sudden rush of something being inhaled,” reports NBC Washington. Brady said the Hazardous Materials Team investigated the scene but did not find any white powder. The people in the building are OK and were not taken to the hospital, said Brady. NBC Washington reports that churches and businesses were evacuated as a precaution. Below is a map of the area of the incident.